VIEW AT YOUR LEISURE IN OUR HEATED SHOWROOM..... TAKEN AS PART EXCHANGE & PRICED TO SELL..... YOU WILL NOT FIND A NICER EXAMPLE FINISHED IN THE BEST COLOUR COMBINATION OF METALLIC SILVER WITH GREY CLOTH UPHOLSTERY ON ALL 7 SEATS..... 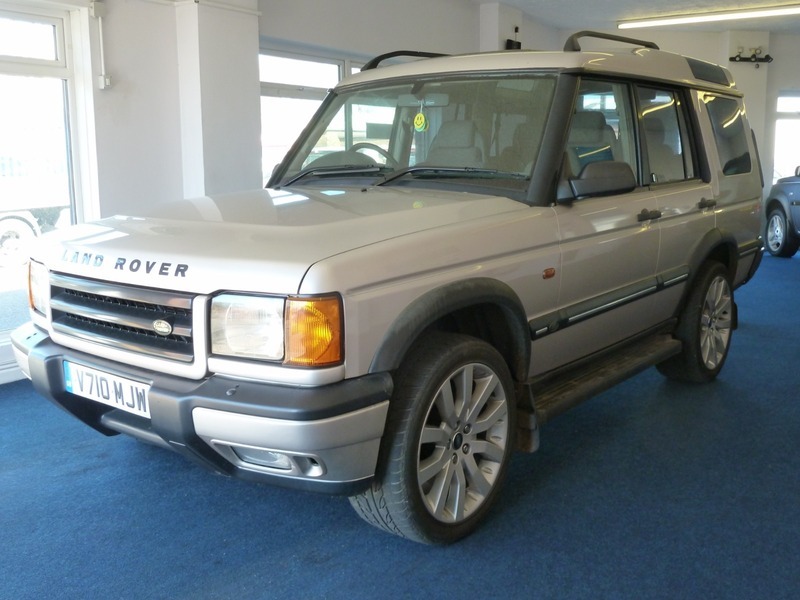 STUNNING V REG LAND ROVER DISCOVERY 2.5 TD5 GS 7 SEATER 4X4. MOT UNTIL 8TH FEBRUARY 2020. COVERED 178,000 MILES HOWEVER LOOKS & DRIVES LIKE IT HAS COVERED 78,000 MILES. LAST OWNER SINCE 2011 WITH ONLY 4 FORMER KEEPERS. MOST COMMON ISSUES WITH THE DISCOVERY HAVE BOTH BEEN SORTED: TROUBLESOME REAR AIR SUSPENSION HAS BEEN REMOVED & REPLACED WITH SPRINGS WITH ECU UPDATED BY ULTIMATE LAND ROVER LTD. TROUBLESOME A.C.E. REMOVED & REPLACED WITH BUSHES WITH INVOICE FROM LRTRADE PARTS. UPDATED 20'' ALLOY WHEELS FITTED WITH EXCELLENT MATCHING HAIDA TYRES WITH 7MM TREAD. SUPPLIED WITH 2 REMOTE KEYS, RUBBER MATS WITH RUBBER BOOT MAT & TOOL KIT FITTED WITH REAR PARKING SENSORS, L/R SIDE STEPS, HYDRAULIC REAR STEP, MUD FLAPS, FRONT FOG LIGHTS & TOW-BAR WITH ELECTRICS. OFFERING AVERAGE 31 MILES PER GALLON & ONLY £255 PER YEAR ROAD TAX OR £22.31 PER MONTH ON DIRECT DEBIT. HUGE SPECIFICATION INCLUDING: CRUISE CONTROL, FRONT & REAR ELECTRIC WINDOWS, ELECTRIC MIRRORS, TWIN TILT & SLIDE SUNROOFS WITH SUN-BLINDS, FRONT ARMREST WITH STORAGE, DRIVER & PASSENGER SEAT LUMBER ADJUSTMENT, DRINKS HOLDER, STEREO WITH STEERING WHEEL MOUNTED CONTROLS & HARMON KARDON SPEAKERS, QUICK CLEAR HEATED FRONT WINDSCREEN, MULTIPLE AIRBAGS, 5 X 3 POINT REAR SEAT BELTS, STORAGE POCKETS IN REAR OF FRONT SEATS, ROOF MOUNTED STORAGE NETS, 60/40 SPLIT FOLDING REAR SEATS, REAR ARMREST, REAR HEADRESTS, REAR ARMREST WITH DRINKS HOLDER, REAR READING LIGHTS, REAR 6 & 7 SEATS FOLD INTO BOOT SIDE SO NO LOSS OF BOOT SPACE, 12V SUPPLY IN BOOT, REMOTE LOCKING & ALARM. PLEASE NOTE: THE VEHICLE IS SOLD AS SEEN & WITHOUT WARRANTY, TO COMPLY WITH TRADING STANDARDS REGULATIONS, THE INVOICE WILL STATE 'SPARES OR REPAIRS'. THERE IS SLIGHT WEAR ON THE DRIVERS SEAT BOLSTER,(SEE PICTURE) WE HAVE A LOCAL COMPANY THAT CAN REPAIR IT FOR £80 IF REQUIRED. Please Note: For Further Information Please Contact Us On 01384 429630 Or 07825 137260. Any Trial Or Inspection Welcome. Viewing By Appointment. Please Call For More Details. Open 7 Days Til Late. All Vehicles Are HPI Checked. All Major Credit & Debit Cards. We Are Located 5 Minutes From The Merry Hill Shopping Centre At Cradley Heath, West Midlands, B64 7AA. 10 Minutes From Junction 2,3 & 4 Of The M5. We Can Tax Your Car Ready For Collection If Required. Please Check Our Customer Reviews And Buy With Confidence, We Have Been Selling Cars For Over 20 Years & Customer Satisfaction Is Paramount. We Can Arrange Pick Up From Cradley Heath Train Station Which Is A 20 Minute Journey From Moor Street Station, Birmingham. Delivery Can Be Arranged, Please Enquire For Price.